Back to popular demand, our Organic Africa Pavilion at the BioFach trade fair is bigger than ever. On two Organic Africa Pavilions which total nearly 180m2, we will host 24 exhibitors from 10 countries. 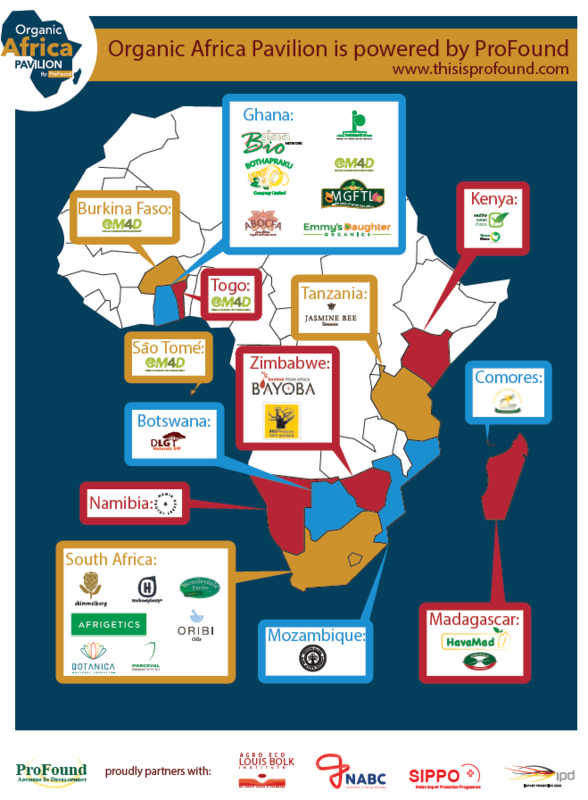 The steep increase in market access needs from African suppliers shows the continent’s readiness for export. From 13 – 16 February 2019, these exhibitors will be ready to meet potential business partners. You can find them at stands 4-359 and 4-571. Companies from Ghana, Kenya, Madagascar, South Africa and the Comoros, offering various herbs & spices, citrus peels, cocoa beans, fresh papaya, tiger nuts, and fruit juices and purees. At this stand our partner Agro Eco will present its OM4D project in Ghana, Burkina Faso, Togo and Sao Tomé. Companies from South Africa, Namibia, Mozambique, Tanzania, Botswana and Zimbabwe, presenting their medicinal plants, essential oils, vegetable oils, herbal teas, honey, baobab, moringa, marula, and jojoba. Learn more about the FairWild standard and how to apply for it from the FairWild Foundation at this stand. ProFound proudly partners with Agro Eco Louis Bolk Institute, Netherlands-African Business Council (NABC) and the German Import Promotion Desk (IPD). Want to make an appointment at BioFach? E-mail biofach@thisisprofound.com.